Ma Ohn Kyi, 44, leans on one foot against a wall inside Mae Tao Clinic on the Thai Burma border. What should have been a routine operation to fix a broken foot turned into a saga and a shocking condemnation of Burma’s healthcare system. Ma Ohn Kyi claimed that a doctor at the hospital inspected her and then demanded 300,000 Kyat (around US $2,700) for an operation to fix her foot, saying she would receive no treatment until she paid. To add insult to injury Ma Ohn Kyi said she was forced to pay for added expenses including bandages and the water given to her while she was bedridden following the operation. 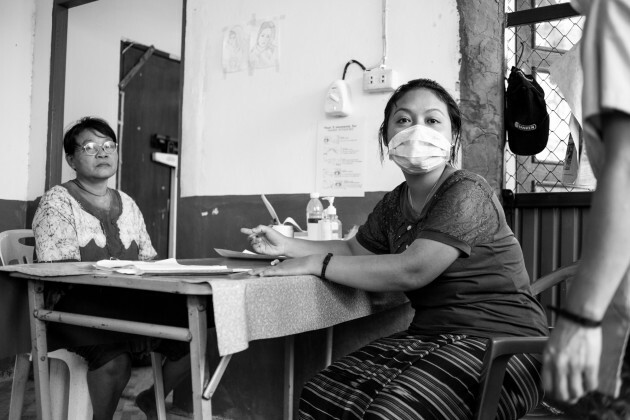 Ma Ohn says that coming to MTC, which provides free healthcare to thousands of migrant workers and people from Burma every year, was not an easy choice; the journey was a long and expensive one and her husband has to work in town to support them both while she recovers. “The government does not support us normal people. Even so, I would like to go back to Burma as soon as possible though because my husband works for so little here – just 80 baht for a full day’s work as a delivery driver. My husband was a fisherman in our village and I would sell vegetables. We could earn 80,000 Kyat in a month,” she adds. In the 2013 budget, the military-backed government spent 3.9% of funds on health, while 21% went to the military. The World Health Organisation has in the past ranked Burma’s healthcare system as one of the worst ranking it 191 out of 192.